Dr. Claude G. Beardslee was a professor emeritus of moral and religious philosophy at Lehigh University while also serving as the university’s chaplain from 1931 until he retired in 1947. As a professor of moral philosophy, he was interested in the decision making process that people went through, especially in relation to our democratic system. Lehigh’s Special Collections currently holds three sets of boxes that could have been used for his classes. Upon opening the box, two books sit on top, both written by Beardslee himself. 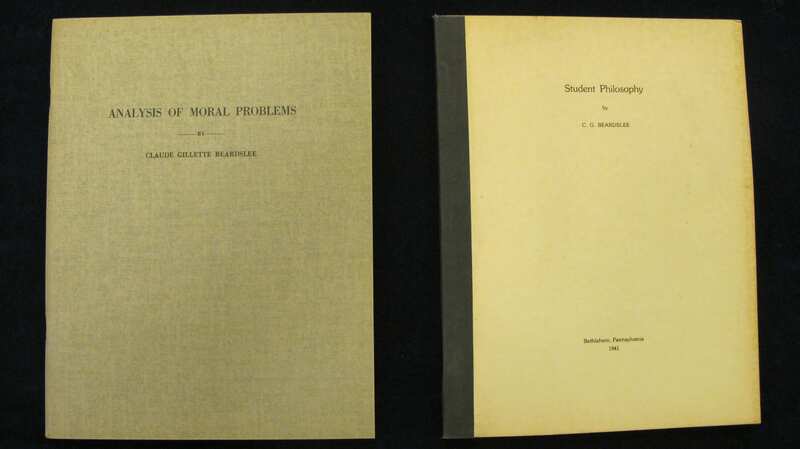 The first book is Analysis of Moral Problems. In this document, he aims to preach the betterment of society and democracy through the strengthening and teaching of the public in morals and self-governance. The second book is Student Philosophy, which aims to help develop a personal philosophy for students who read it. It is surmised, as there are multiple sets of boxes, that Dr. Beardslee would give these to his graduate students in his Proseminar classes (M.R.Phil. 100 & 101). 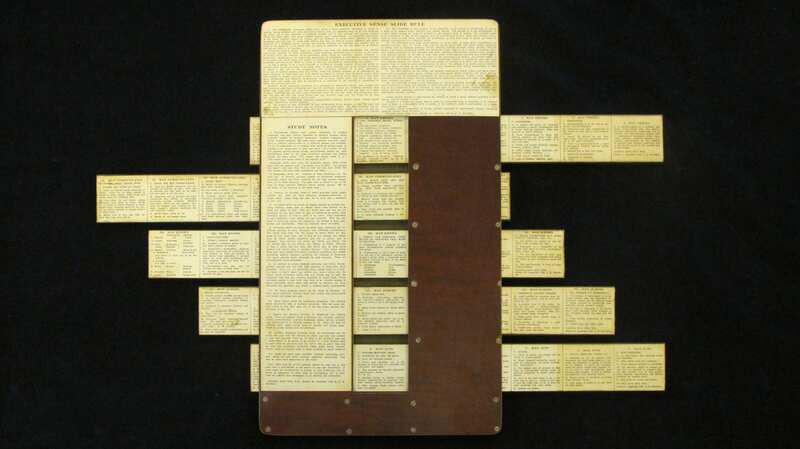 The most interesting object in these boxes is a large wooden tablet with small planks that have a multitude of moral definitions and suggestions printed on them. The tablet and planks fit together to create an “Executive Sense Slide Rule.” The Executive Sense Slide Rule is a device for analyzing problems and questions in light of different ethics systems and different situations. Dr. Beardslee, in Section A of the slide rule’s instructions, says “The purpose [of the slide rule] is to aid self-education in a spirit which employs the forms of certainty in the personal skills of wisdom.” Earlier in this section, he expressed his belief that the “best conduct and best happiness” come from those whose internal morals are cemented as their character. He does not mean that the morals must be static; he says that there are at least three different moral systems, only one being truly static. 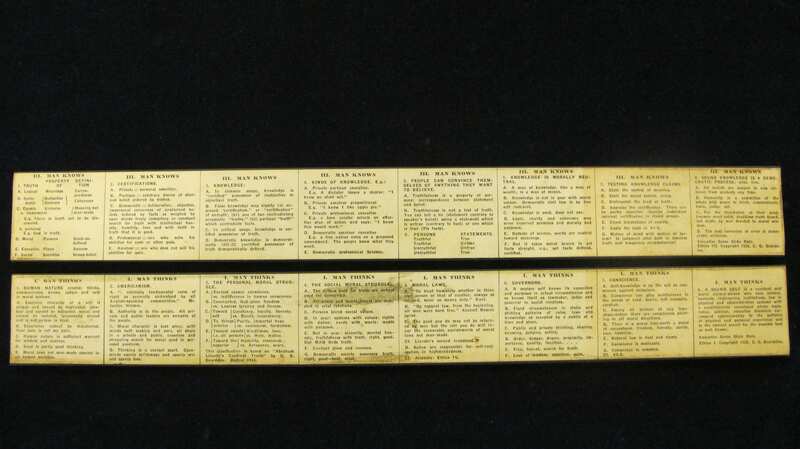 The slide rule is used by going through and thinking about how the situation being analyzed fits within the “five forms of character”: thinking, communicating, knowing, judging, and acting. Each movable plank represents one of these characters and has sections for different ways and perspectives from which to look at a problem. Once decided upon one, the rule will give a list of philosophical definitions, wisdom, or knowledge that may be applicable to the situation. This is done for all five forms of character and then the user will have a well formed view of the problem at hand and, ideally, know the implications of the decision they make. The attempt to systematize a philosophical system such as ethical decision making is a noble effort. The way in which Dr. Beardslee went about creating this system was undoubtedly inspired by the engineering influence at Lehigh University. With the pursuit of engineering and scientific advancement at the university, all should be mindful that any progress is best made under an ethical code. This is to ensure that we do not harm or hinder our neighbors, country, or environment. Dr. Beardslee seems to be creating a unified philosophy for those who are making decisions that will affect everyone. This pursuit aligns with the creation of engineering ethics in the major engineering associations in the early 1900s.